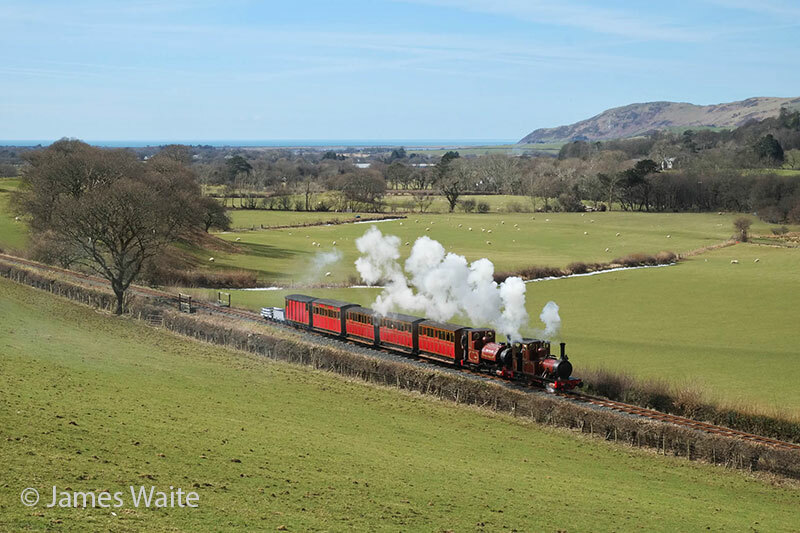 The Welsh narrow gauge lines are famous for their authentic rolling stock, scenic lines and first class heritage efforts. During their running season there is almost no space for running photo charters; and several nice photo spots are unreachable. Only when the regular service rests you have all the time you need  and all the rolling stock will be available. Weather conditions in Wales are well known. You might have dull, rainy, windy, cold weather, not only in November, but when the weather co-operates you have a fantastic theatre-illumination of the green mountains with a very low, intense sun, which is worth all the efforts. Glint shots can be amazing then. 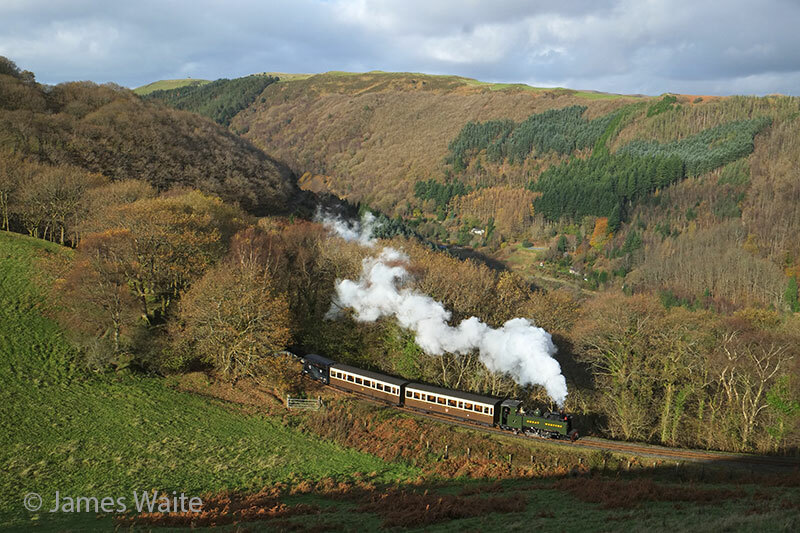 Travel to Wales, an early afternoon arrival is recommended. 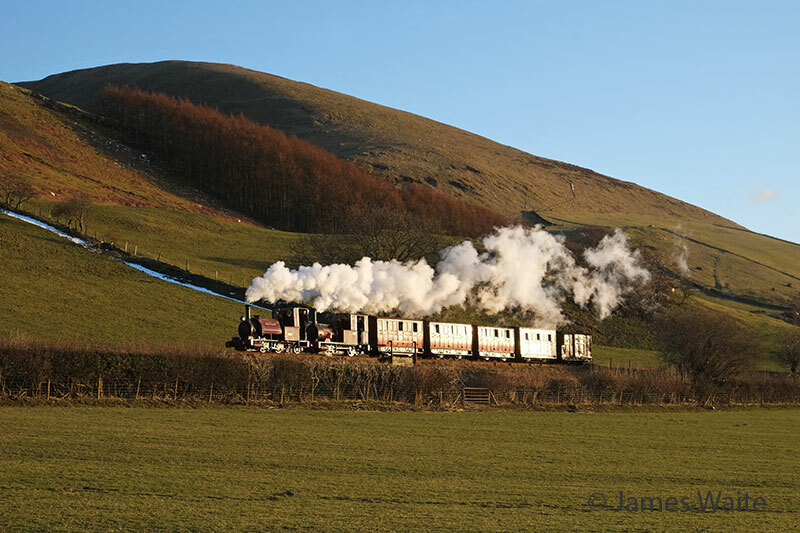 If the weather cooperates we will perform some run pasts on the Cob with Hunslet 1215. 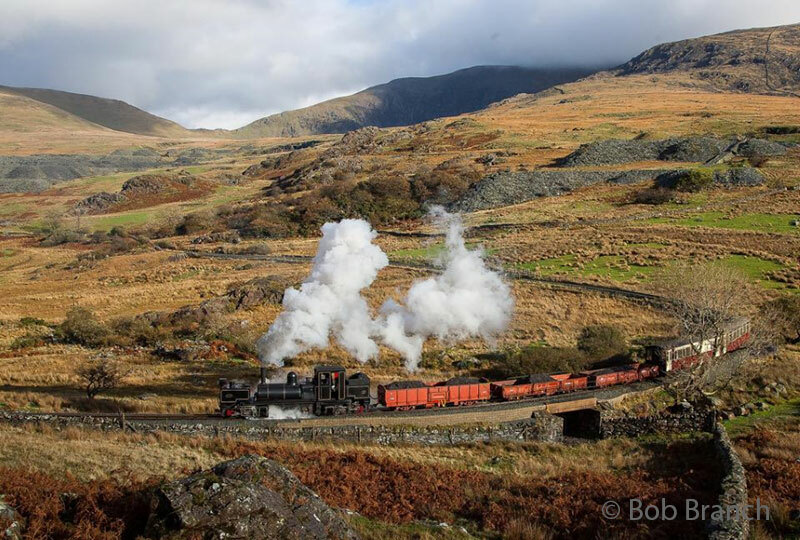 Welsh Highland Railway: We’ll run two NG16 Garratts on two typical SA consists, one pure freight and one mixed. 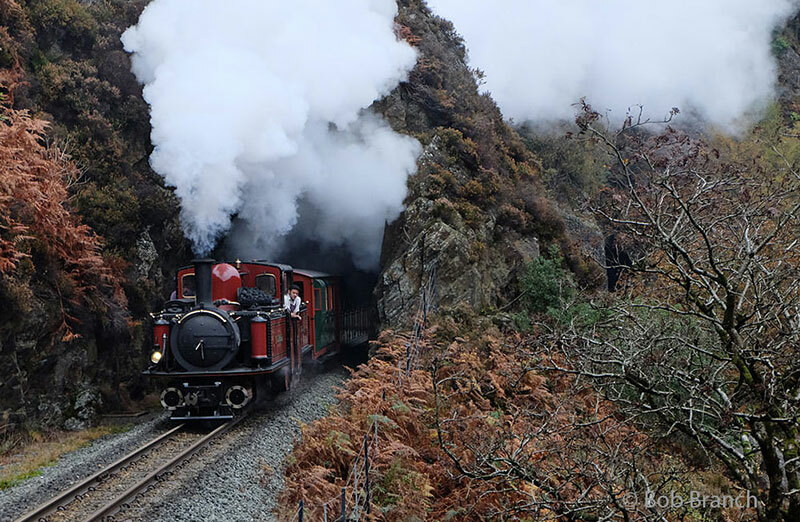 Ffestiniog Railway: Or first day is an all England engine affair with three in steam and hopefully Princess posed in Harbour Station. Consists will be a slate train of at least 30 wagons and the FR Plum and Spilt Milk vintage train set. 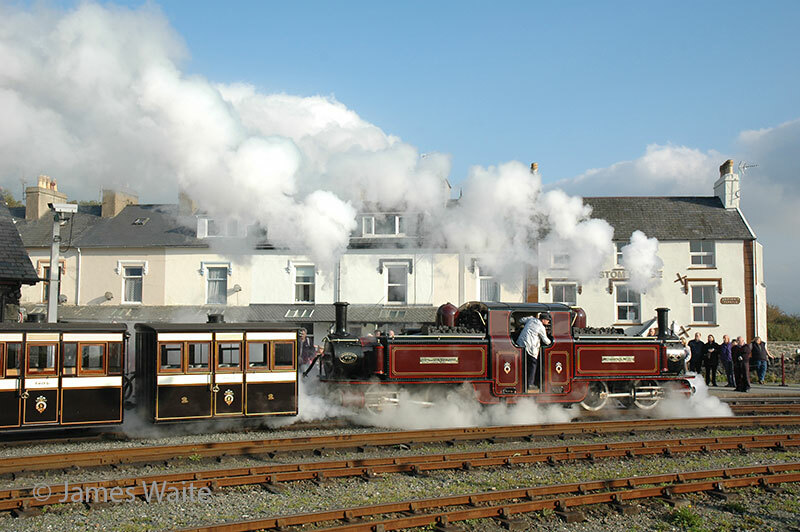 Ffestiniog Railway: On our second day will see two Fairlies in steam with the same consists. 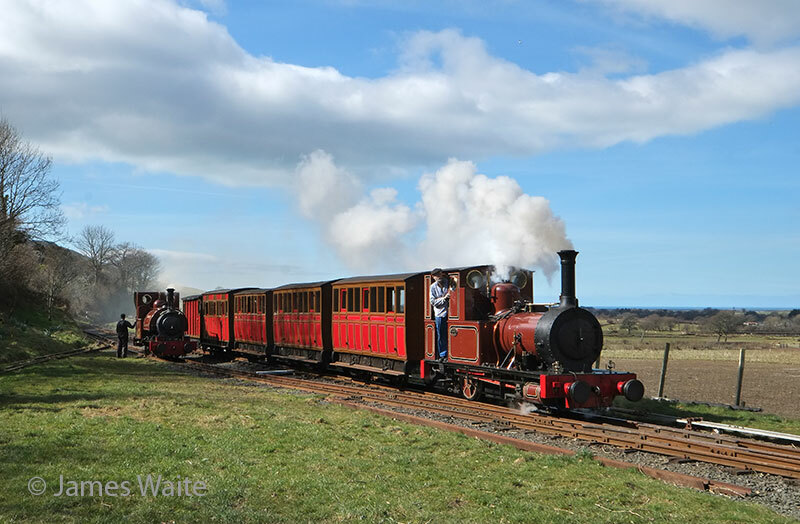 We try to get the Hunslet 1215 with the new FR freight set in and around Harbour Station in the morning and afternoon, which is not confirmed yet. 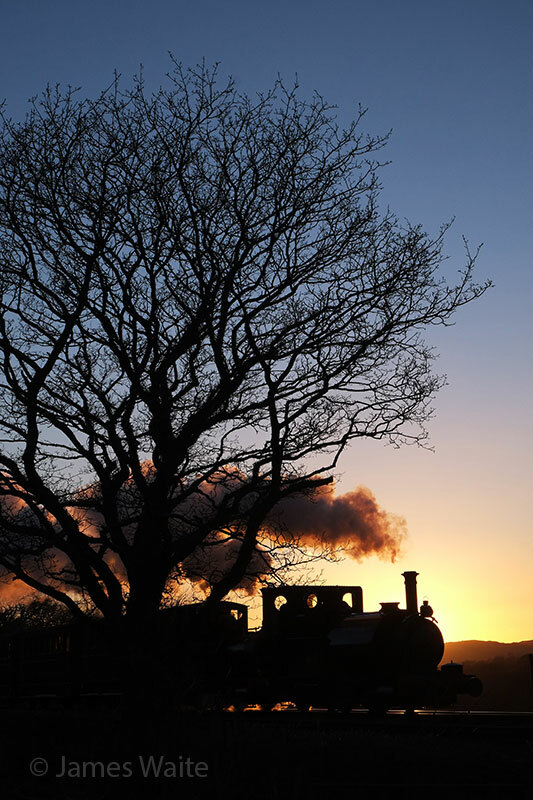 Welsh Highland Railway: we will see authentic and appropriate locomotives run with the vintage Green set plus the NWNGR Maroon coach, and maybe just maybe another Hunslet engine. 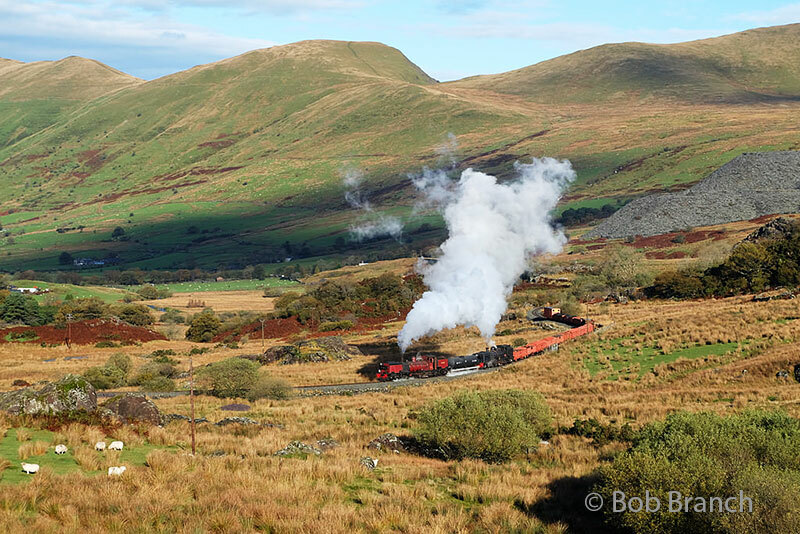 Welsh Highland Railway: another day with authentic train sets. We may see another Hunslet engine. 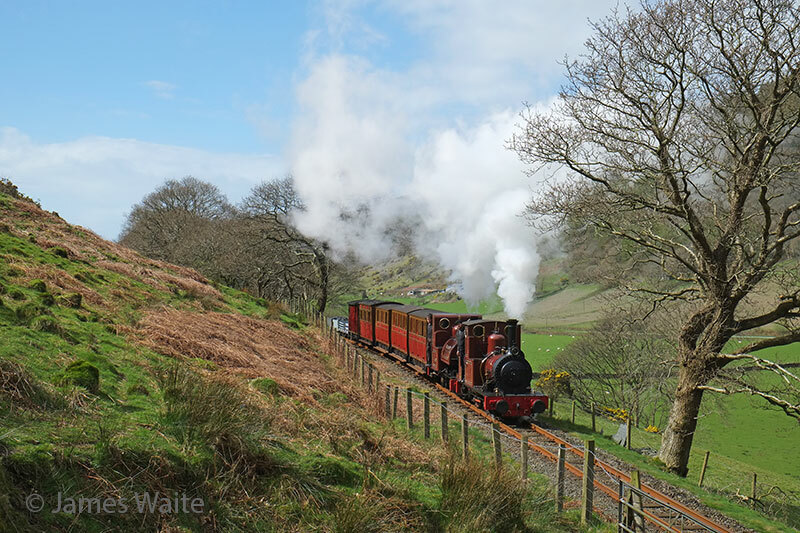 Talyllyn Railway: We’ll charter engine no's 2 “Dolgoch” and 3 “Sir Haydn” with their vintage set plus wagons. These will be run separately and not double headed. 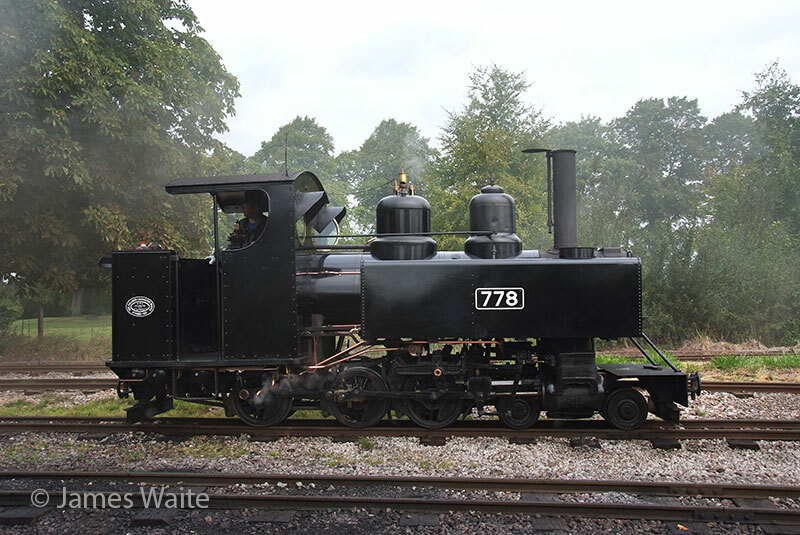 Vale of Rheidol Railway: We’ve arranged engine no 7 Owain Glyndwr plus their mixed consist. 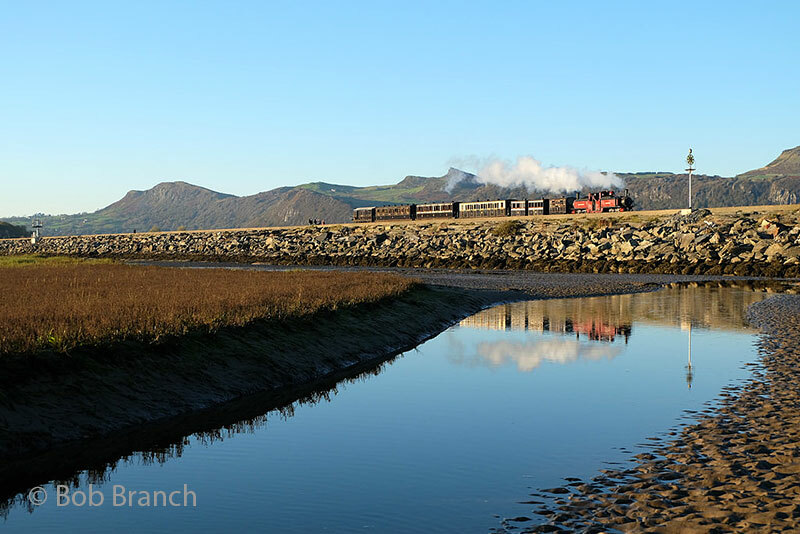 The F&WHR is a marvel that traverses so many different landscapes it's almost impossible to give an accurate line description from A to B, from the Sea at Porthmadog to the Mountains of Snowdonia just enjoy it all. 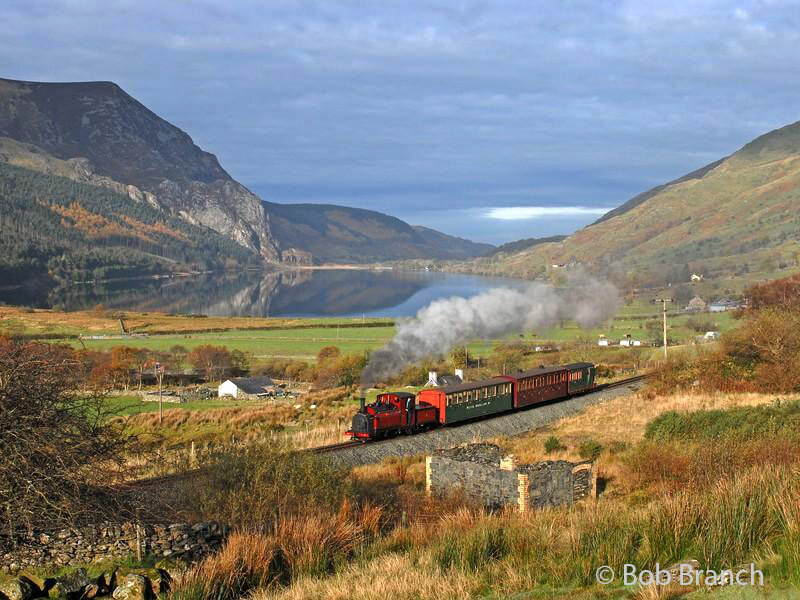 The line is well covered on the internet, so as the Talyllyn and the Vale of Rheidol. The pictures here give you an idea about the railways. 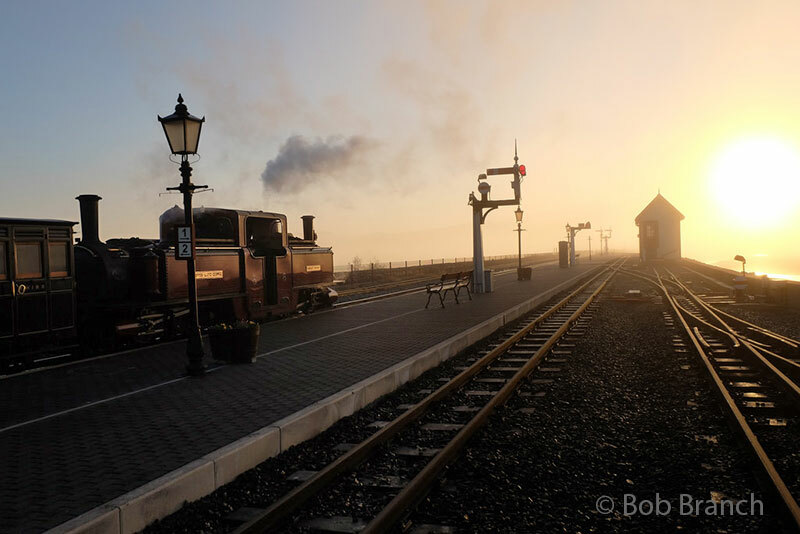 The tour is arranged by Bob Branch in conjunction with Paul Lewin, the GM from the F&WHR, who together have over 20 year’s experience, in organising photo charters at the F&WHR. Between them there is very little else to add to the expansive itinerary as planned. The itinerary might need some adjustments. Locomotives are not guaranteed, they can fail, especially after a long summer season. But the number of available locomotives is so good that we’ll have for sure a good variety of different classes any types. On all five days at the F&WHR we will not be stopping for a lunch break, please bring water and or other non-alcoholic liquids with you, and suitable energy bars or snacks. Although we hope for the better, Wales can be very wet and cold in the first week of November. Please wear appropriate cloths. Please remember that at this time of the year the sun, if any, will take quite a while to come over the Snowdon range of mountains. 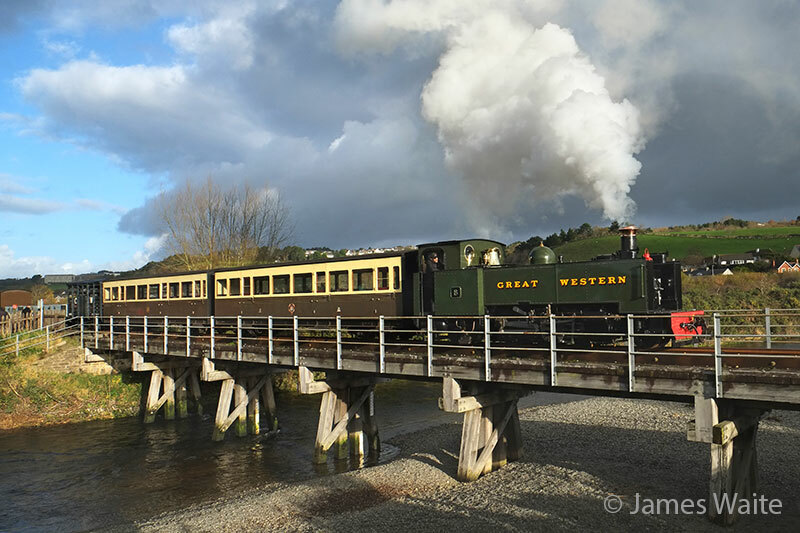 In regards to operating on the WHR we have to cross the standard gauge line, which is controlled by Network Rail, at possibly set times during the morning and afternoon either side of service trains to and from Phwelli. This may restrict our time, however in past years this has not been an issue. While writing this the visa situation for UK in November 2019 is currently unknown. They will or will not leave the EU, hard or soft, with or without a hard boarder. However, we do not expect any sort of immigration problems. There are two ways you can participate: Option A: you book the trains only and arrange everything on your won or you book option B: the full package including airport pick-up, transfers, hotels and breakfast. Safety is a major issue in UK; the safety rules are as strict as they’re used to be in developed countries. Jumping on and off trains is strictly prohibited and will not be tolerated. You always need to follow the instructions of the railway staff and we may need to sign a waver. Standing too close to the track is not advisable, especially in regards to the very tight clearances on all four railways. We’re not allowed to do any sort of “gardening”, as after all the WHR in particular runs through the Snowdon National Park and they would take an extremely dim view of tree pruning. Always use common sense when crossing roads and railway tracks. Neither FarRail Tours Club nor the local providers can be held responsible and will not accept any liability whatsoever in the case of any accident or damage or issues, additional costs etc. caused by delays or changes in the timetables. We recommend you to take out an accident insurance and travel cancellation insurance.